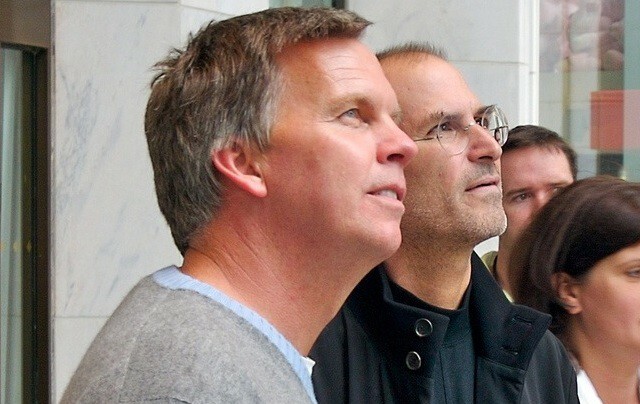 Ron Johnson and Steve Jobs at the grand opening of Apple's 5th Ave. store. When Steve Jobs unveiled Apple’s first retail stores in 2001, pundits said they were a costly mistake and he’d be closing them within a year. A decade later, Apple has reinvented retailing with a chain of 300 shops that make more money per square foot than Tiffany & Co. Here are some of the best quotes from Jobs and the chief architect of the stores, Ron Johnson, about their retail philosophy, strategy, and execution. This is a guest post by Gary Allen of IFOAppleStore, who has followed Apple’s retail experiment very closely for more than a decade. His site is a fantastic resource for everything Apple retail. It was originally published here. Also read the full reports on Ron Johnson’s Rhode Island School of Design talk, and the 2006 financial conference talk.